FC Halifax Town slumped to a disappointing defeat at home to Aldershot to remain firmly in a relegation battle. The Shaymen still remain two points clear of the drop zone after other results went their way, but they were well below par against an energised Shots side. After a cagey and even first half, second half goals from Jim Stevenson and the impressive Rhys Browne did the damage against a Town side who never got going until the final stages. Late chances for Kevin Roberts, James Bolton and substitutes Connor Hughes and Shaq MacDonald were spurned as Halifax lost for only the second time at The Shay in the National League under Jim Harvey. The Town boss named the same starting 11 which eventually secured that dramatic victory against Boreham Wood in midweek and they almost started like they finished that enthralling game, with Jake Hibbs going close with an early strike. Giorgio Rasulo saw a similar effort trickle wide at the other end as both sides looked to secure a quick devastating blow. Richard Peniket, still looking for his first goal in a Town shirt since his return from injury, had a great chance to get on the scoresheet after a neat knock-down by Kingsley James, but the former Fulham youth star didn’t get any purchase on his shot. Browne, who was a constant menace throughout, produced a silky solo-run – which included sending Kevin Roberts on his backside after an eye-catching nutmeg – but could not produce a finish to match. That would come later. Back at the other end, Jordan Burrow had a shot bravely blocked and James attempted his luck from distance but to no avail. The visitors upped their game as the half-time whistle approached and created a succession of chances. Rasulo could only find the side-netting when one-on-one with Sam Johnson before Stevenson had a low shot deflected wide by the excellent Scott McManus. Town’s left-back then produced a fantastic clearance to thwart a wicked Browne cross. There was, however, still time for Johnson to deny Ross Lafayette with an instinctive one-handed save at his near post. But there was nothing Johnson could do immediately after the restart when Stevenson met Browne’s teasing corner with a thunderous header. It was a disastrous start to the second half for Town and things nearly got worse six minutes later but Johnson was at his athletic best to save Charlie Walker’s free kick. The Shaymen, with only one home defeat in 15 outings during Harvey’s rein, tried to restore parity and came close through Burrow’s chested effort from a James cross. It wouldn’t have been a goal of the season contender but it would have been a vital contribution from a striker who had scored his first goal since November 28 in the 3-2 win over Boreham Wood in midweek. James was beginning to have an influence on the game and came close with a deflected drive just after the hour mark. The former Chester man then had the ball in the back of the net but the whistle had already gone for a foul on Dan Thomas who, unlike his opposite number, was never really severely tested on a consistent basis. Johnson was soon called into action again when Browne found acres of space, but Town’s goalkeeper easily saved his low shot. With time running out it was the visitors, already on the magical 50-point mark before proceedings, and not the relegation-threatened home side, who looked the most dangerous. Hamza Bencherif, who put in yet another competent display at the back, produced a timely intervention to prevent an effort from Walker but the Shots got a deserved second from their next attack. The visitors stuck to their game plan – opting to find the electric Browne at every opportunity – and the Antigua and Bermuda international did not disappoint as he flashed a cracking shot past Johnson from 18 yards with seven minutes remaining. 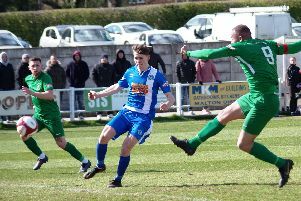 Doubling their advantage sparked a Town outfit – who had only failed to score once at home in the league under Harvey - back into life as they went close through Roberts who headed over a McManus corner. And, in what turned out to be nine minutes of injury time, the Shaymen created – and wasted – a succession of opportunities. James Bolton’s powerful header was kept out by Thomas, despite strong claims that the ball had already crossed the line. Connor Hughes, the hero from Tuesday evening’s dramatic events, had earlier replaced captain Nicky Wroe, and he let fly with a trademark 30-yard thunderbolt which, fortunately for the visitors, flew straight into the arms of Thomas. Fellow substitute McDonald’s tame effort failed to trouble the Shots’ goalkeeper, but it wouldn’t have been more than a consolation.